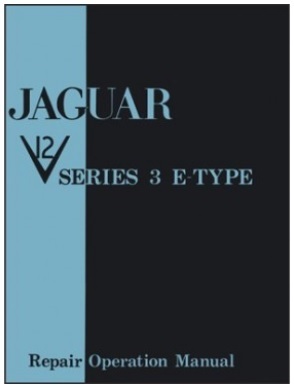 Jaguar Series 3 V12 E-Type Repair Operation Manual. Reprint of the original Factory Service Manual. Very helpful for complete strip and rebuild or just day to day maintenance. 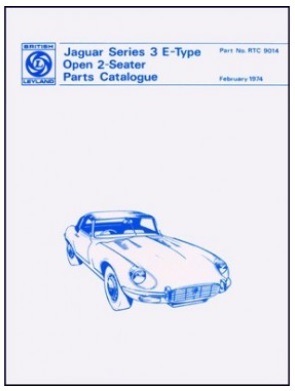 This factory repair and operation manual covers Jaguar V12 Series 3 E-Type. While the original purpose of this manual was to assist Jaguar mechanics to maintain or repair V12 E-Type Series 3, the restorer or skilled home mechanic will find invaluable data and instructions for their S3 project. 476 pages, illustrated with charts & wiring diagrams. New re-print of the original 1970's book including a FREE Maintenance Chart (A2 size poster). Quote "This Handbook gives the information necessary for the satisfactory operation and maintenance of the Jaguar E Type"